By small we mean smaller size, lighter weight and smaller electricity generation production capacity than the very big wind turbines in the wind farms. Least but not last, a cost that an average household can live with. Direct drive (the turbine rotor directly drives the DC generator) for the very small turbines rather than geared mechanism for the larger unit. The turbine inherently produces DC (Direct Current), and conversion to AC (Alternate Current) is required. (The conversion is performed by an inverter). The inverter is sometimes integrated into the turbine. As a rule of thumb, the turbine must be elevated to at least 30 feet (7 meters) above the tallest object within a 500 feet radius (150 meters). 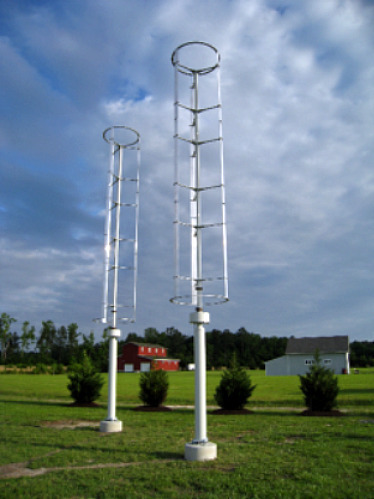 So, one need a substantial land around the turbine and one need a wind turbine tower. Obviously, there should be enough wind in the region. One can judge by his experience or resort to wind maps available from the AWEA (American Wind Energy Association Site).